No, the water has not been Photoshopped. 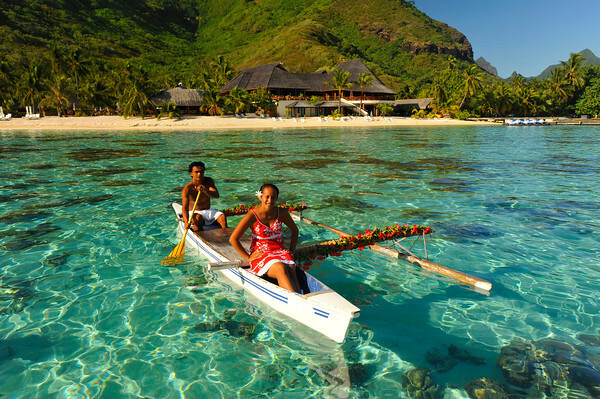 Tahiti is one of my favorite destinations in the world, a paradise of overwater bungalows, fine French cuisine and lagoons teeming with tropical fish. The islands of Tahiti feel like they are a world away, but it's only takes eight hours to fly from Los Angeles to Tahiti's capital city, Papeete. The biggest obstacle has always been the price, with fares running $1,600 and higher. But with Air Tahiti Nui's new Paradise Found sale, you don't have to be a baller to visit one of the most gorgeous places on the planet. Dig out your swimming trunks and your P90X DVD because you're about to save yourself nearly $700, player for real. During a limited booking window (April 8-21), you can save up to 41 percent on an Air Tahiti Nui roundtrip ticket from LAX to Papeete. That breaks down to $998 for a roundtrip economy ticket, inclusive of all taxes, fees and fuel surcharges. Travel dates must occur between June 1 and July 17 or between Aug. 17-31. The craziest thing of all is that these travel dates take place during Tahiti's peak travel period, when summertime temperatures hover in the low 80s and the sun shines nearly every day. So if you've always dreamt of a take-your-breath-away vacation, now is the time to book it. Go here before April 21 to reserve the discounted fares or call the Air Tahiti Nui office at 1-877-824-4846. And, if you're going to be saving all that dough, you might as well splurge on a nice French champagne. Might I suggest a bottle of Crystal? Pour a little out for your home girl, would ya?